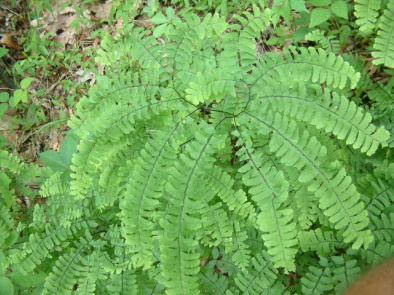 The Maidenhair Fern is recognized by a shiny purple leaf axis and a graceful, flat leaf outline. The leaves are up to 14 inches in length. The overall shape of the plant gives a fan-shaped impression. The stipe forks at the summit, and several pinnae branch from the fork. The plant grows from 8 inches to 20 inches tall, and is found in rich, rocky woods.